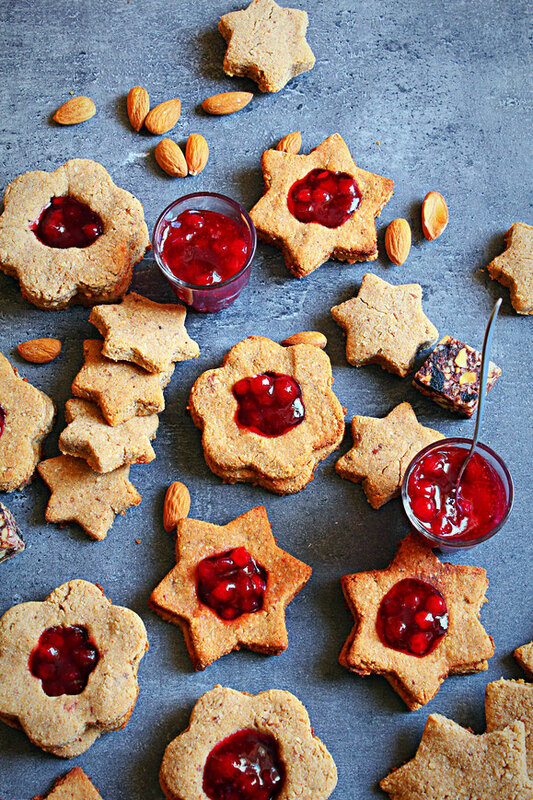 Soft Gingerbread Cristmas Cookies - simply & healthy vegan recipes that taste amazing! Start by blending the rolled oats and the almonds in a blender until you have a fine flour. Mix the oat-almond flour with the baking powder, coconut sugar, coconut flour, vanilla and spices. Set aside. Blend the bananas with the other wet ingredients, add the chickpeas and soaked raisins and blend until smooth. Add the dry and wet mixture in a large bowl and knead them toegther until you have well combined dough. It should be a little sticky when you are finish. Roll or press out the dough on a parchment sheet and cut out cookies. Preheat the over to 200 degree celcius and bake the cookies for 15 minutes. Heat the berries, coconut sugar and lemon juice in a small pan and bring the mixture up to a boil, stirring frequently. Smash the berries with a fork. Continue to boil, still stirring frequently, until the fruit is thick, about 10-20 minutes. 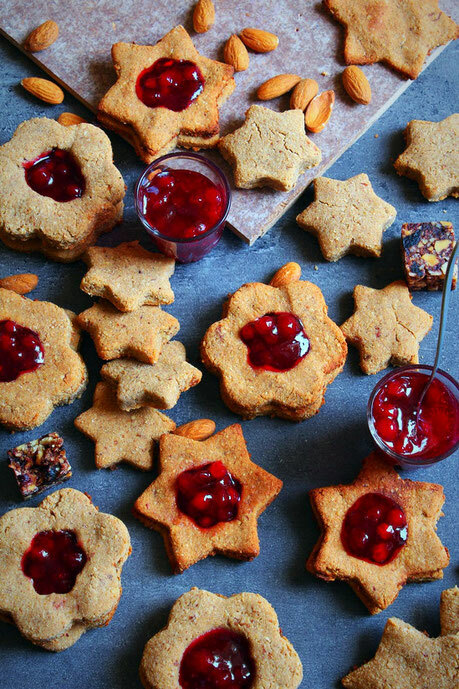 Decorate your cookies with the jam. Enjoy with tea, mulled wine, coffee, or hot chocolate! I loved making those christmas cookies and I hope you also enjoy it! Let me know if you have any questions in the comments below. Vielen lieben Dank Laura!! Freue mich, dass es dir gefällt!! !